A blank stylesheet or starter theme with no media queries. A theme that already uses the mobile-first approach. Mobile-first is considered best practice. The end result for mobile tends to be better if the site was initially designed for mobile – designed with the constraints of small screens in mind. Mobile-first can produce faster page load on mobile. One example of this is background images. If you set a small image globally and a large image inside a media query, mobiles only download the small image. If you reverse this, mobiles download the large image as well as the the small image. This is what happens with the desktop-first approach. Microthemer’s default media queries are desktop-first oriented. But if you like the mobile-first approach you can use a mobile-first set in Microthemer. Click the Edit media queries icon under the MT logo. In the Default screen width for “All Devices” field, enter 320. This makes it easy to see how your general styles affect mobile devices. Click the Load an alternative media query set link. Choose the Mobile first device MQs set. 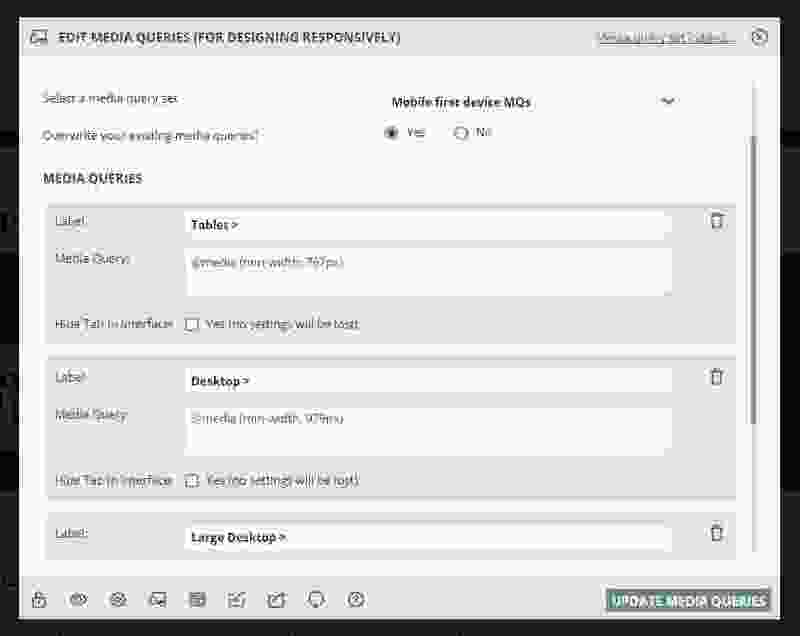 Decide if you want to overwrite or merge the new mobile-first set with your existing media queries. Note, if you overwrite, you will lose any styles you applied to your existing media queries. Click the UPDATE MEDIA QUERIES button. Mobile has taken over desktop. So it’s reasonable to prioritise this group of users when starting a new project. But redesigning your site from scratch can cost a lot of time. This should be weighed up against the advantages of mobile-first design. For many, it makes business sense to add extra mobile styles to an already functioning desktop-oriented site.